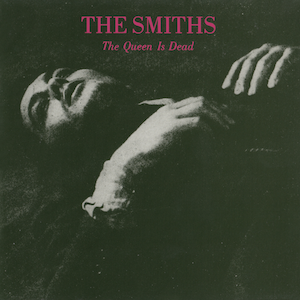 This week, I’ve been listening to The Smiths’ 1986 album “The Queen is Dead” for what I can learn to improve my craft as a songwriting musician. I remember my introduction to this album well. It happened twenty-five years ago, when I was sixteen. I went to a rural school in Ohio. A new kid from Colorado lent me a mixtape to introduce me to music he was into. Between the tracks by groups like Fugazi and the Rollins Band, was a song got my attention. When I asked my friend about the song, he groaned. “My friend made that tape for me and put that song on their as a joke to annoy me.” I immediately fell in love with The Smiths. This week was neither an introduction, nor a revisit, as I’ve been listening to it ever since I first heard it. The music mixed the old and the new; innovative but through a lens of nostalgia. Just the sound of it felt like warm sadness with lyrics unapologetically near maudlin. The lyrics were boldly melancholic, self-aware, sardonic, and sad. There was a touch of humor without comedy. It was like nothing I’d ever heard before, but the atmosphere made it feel like a lost memory. The song “There Is A Light That Never Goes Out” was my introduction to the Smiths. It remains one of my favorite songs by any artist. The lyrics of this song show obvious influence from the New York Dolls’ “Lonely Planet Boy which is also one of my favorites. Johnny Marr also borrowed a guitar riff from the Rolling Stones’ cover of “Hitch Hike” which was also copied by The Velvet Underground. Light reverb touches the light jangly multi-tracked strummed acoustic guitars creating the first layer of nostalgic atmosphere. The strumming is a standard rhythm guitar pattern. Mike Joyce, likewise, plays a standard and appropriate drum pattern without flourish. Andy Rourke’s bassline provides the only real melodic interest to the musical accompaniment. During the chorus, Marr plays the synth-string on an Emu Emulator with long high-notes with a few trills, again with a light reverb. Later, also is a flute line hauntingly, but playfully, played under a verse. All of these simple elements come together beautifully through layering and production. While the instrumentation is simple, the chord progression itself is fairly unusual. The tonic chord barely gets used as one until the chorus, which is part of what let’s the chorus sounds as if it is an answer to some question not quite posed by the verses. The title track “The Queen is Dead is a beautiful mess of organized chaos. A sample from the movie “The L-Shaped Room” starts the track. Then a tom drum loop pounds introducing the drive of the song. This is joined by the rest of the drums, which were recorded separately. A driving bassline supports the track. Layers of rhythm guitar play V-V-V-V-V-V-VI# for most of the song, closing with a coda of V-VI#-I. At least, that’s how I hear the chord progression. I always feel a little uncertain when there’s a borrowed chord (the VI#), if I’m notating it correctly. A wild guitar with incredible feedback through a wah pedal enhances the sense of chaos and urgency. It also buries the less crazy rhythm guitars. The opening verse makes clear the speaker’s opinion of English royalty. I’m not sure what exactly is meant by the “boar between arches” line. A search online lead me to plenty of discussions, but not real consensus. I particularly liked the idea that potential play on words with ‘boar’ and ‘bore’ and ‘arches’ with ‘archers’. I also saw mention that the arches were historically a symbol for royalty and that Richard III’s emblem was that of a boar. The Richard III bit seems more coincidence than meaningful to me. It’s also not certain if the speaker feels hemmed in, if the marshes are hemmed in, or if the Queen is hemmed in. Regardless, what we have here are biting comment on the Queen written much more poetically than usual pop and rock lyrics. Musically the song rolls through the 50s chord progression (I-vi-IV-V) at a slow tempo starting at about 70 BPM and rising to about 76 BPM for the climactic coda. The drums are minimal through most of the track, focusing mostly on a jazz-inspired use of cymbals and tapping the rim. The electric guitars gently strum chords giving plenty of room for the vocals. Of course, I could go on and on about one of my long-time favorite records.